Sometimes you have to get creative when considering how to remake a property. That’s the case with a former car wash near Central and Webb Road. Owner Dave Weatherson has come up with an adaptive reuse for that property that will result in an office/warehouse development at 602 N. Webb. 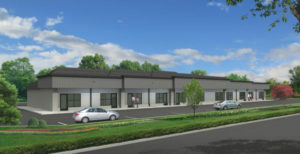 The existing car wash bays will be repurposed as smaller warehouse space, says Ross Way, a partner at Anderson Management Co. Inc., which will be the property manager and leasing agency. The development will be called BizBox Suites, Way says. A project to add about 3,700 square feet to the south side of the building could start any time. Commerce Construction Services Inc. is the general contractor. Architectural Development Services is the architect. A building permit valued at $500,000 has been pulled for the building expansion, public records show. Way says the addition will be used for offices. The building will have around 11,000 square feet once the expansion is complete. May is the targeted completion date. He says two leases already are pending, though he declined to disclose specifics about the tenants. Anderson Management is the property manager for some of Weatherson’s other office/warehouse properties around Wichita.